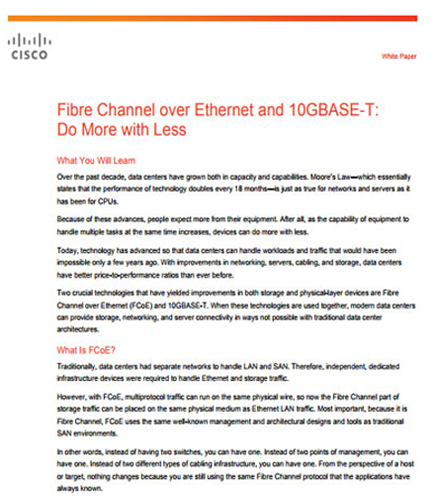 Fibre Channel Over 10GBASE-T Ethernet: A Breakthrough! "Fibre Channel Over 10GBASE-T Ethernet: A Breakthrough!" “Do more with less” has become the technological mantra, for data centres that have grown both in capacity and capabilities. Two crucial technologies that have surfaced and contributed improvements in both storage and physical-layer devices are Fiber Channel over Ethernet (FCoE) and 10GBASE-T. The use of the two technologies together enhances the modern data centers as it can provide storage, server connectivity, and networking in ways that was not feasible with traditional data center designs. Ethernet technology is continuing to advance with new physical attributes that provide more options for lowering the cost of reliable storage connectivity in the data centers. How does FCoE & 10GBASE-T enhance storage and physical-layer devices? How is FCoE & 10GBASE-T different from traditional LAN and SAN? Is the advancement with server virtualization cost effective for your business?